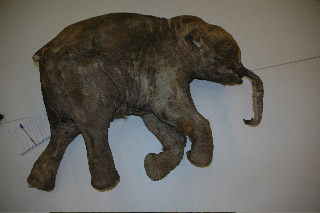 Photo of a remarkably well-preserved baby mammoth -- at least 10,000 years old -- discovered recently in Siberia. 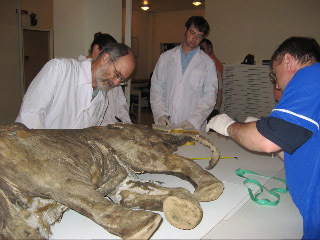 Carcass of the 4-month-old mammoth, known to researchers as Lyuba, on an examining table in a Russian laboratory. that colonized the carcass after it eroded out of a Siberian riverbank.